with many hues of indigo blue. Often the most spectacular designs in Oriental rugs are those with glowing, contrasting colors. Although in many styles the deep reds that we are familiar with do most of the “talking,” it is the other colors surrounding them that make the design come alive. One such contrasting color is blue, or indigo. It is the color that symbolizes mystical wisdom, self-mastery and spiritual realization. Blue also represents the sky, the water, and the journey of the after-life. Historically indigo is among the oldest dyes to be used for textile dyeing and printing. A 7th century BC Mesopotamian cuneiform tablet gives a recipe for the dyeing of wool, and describes how wool colored like lapis is produced by repeated immersion in indigo and exposure to air. Because indigo could not easily be grown in many rug producing areas, most of it was imported, and the pigment was a large component of the Spice Trade along the Silk Route for centuries. Indigo dye falls into a different category than most other natural dyes because it doesn’t require a mordant to attach to the fiber. But its preparation is complex, and includes fermenting the leaves, dissolving the water-insoluble active ingredient indigotin in an alkaline solution, and producing a dye bath that is light yellow in color which turns yarns into deep blues when oxidized with exposure to air. An enormous range of blues can be obtained by repeated dying. Indigo dyes can also be pressed into cakes, dried and powdered. The powder can then be mixed with various other substances to produce different shades of blue and purple. Indigo is the only provider of a true, long-lasting natural blue dye. Vegetable dyed rugs with their natural abrash (variegation) have a richness and harmony of color that softens beautifully over the years, making them excellent candidates for family heirlooms, the antiques of the future. 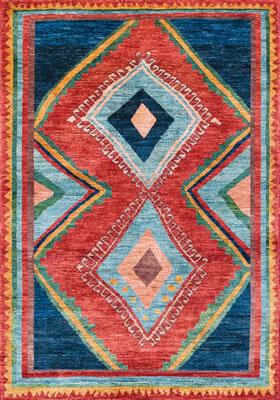 At The Magic Carpet, we have a wealth of vegetable dyed rugs, many of them vibrating with deep, lively blues. We’d love for you to come by and peruse our gallery or view our collection online at www.themagiccarpet.biz. The Magic Carpet will be offering monthly educational articles on the extraordinary art and history embodied by Oriental rugs. Our next article will be on the color yellow.